Jakarta - Toyota Global Environment Month is an annual event that is participated by all Toyota affiliates around the world and implemented every June as it commemorates with International Environment Day on 5 June. 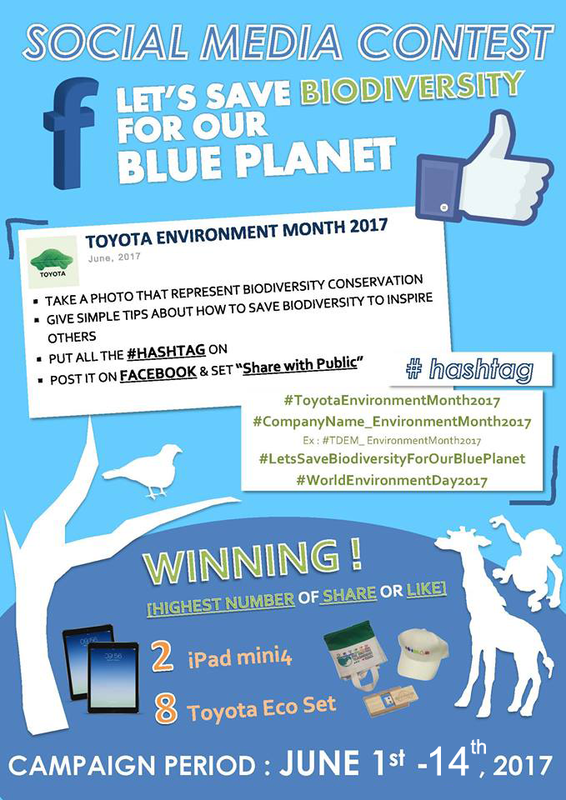 On this occasion, TDEM as Environment Management Promotion Office (EN), invites TMMIN team members to join the contest in social media with the theme "Let's Save Biodiversity for Our Blue Planet" that held on 1-14 June 2017. Take a photo that representing biodiversity conservation. Upload to your Facebook and do not forget to set to share to the public. Photos should be taken by the original team members themselves. Photos must be uploaded to Facebook with the hashtags already mentioned and shared publicly. Caption / caption photo needs to be made as attractive as possible in English. Photos and descriptions should be related and easy to understand. Photos and descriptions can raise people's awareness of the environment and biodiversity. This contest may only be participated by team member of Toyota Indonesia (TAM / TMMIN). Upload photos done on 1-14 June 2017, passing from it is not counted. The calculation of like & share is done on June 21, 2017. Not only that, the winning photos will also be covered in the AP Environmental FY Report 2017. Let's upload your photos now and win the prizes!